A new ‘passport’ has been launched by Harrogate and District NHS Foundation Trust to make carers feel more welcome when supporting people they look after in hospital. 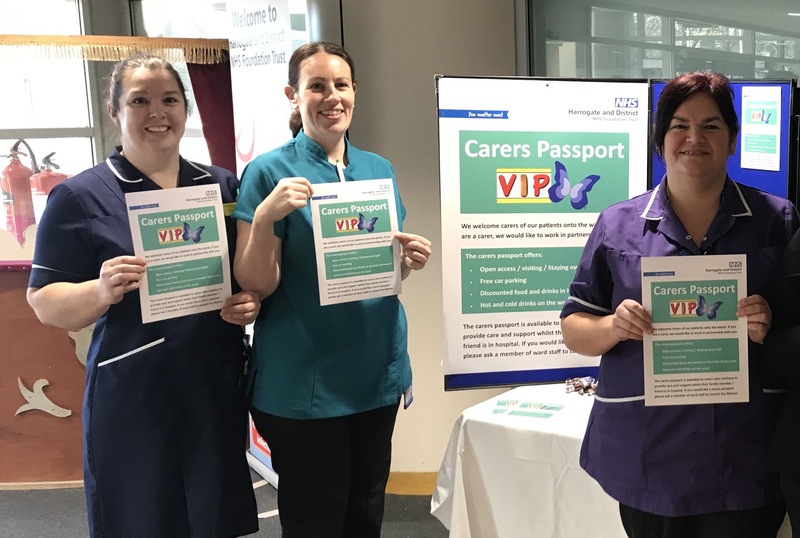 The Carers’ Passport aims to provide support to carers who are looking after patients while they are staying in Harrogate District Hospital and Ripon Community Hospital, and offers them the opportunity to work in partnership with hospital staff. The Trust defines a carer as somebody of any age who provides help and support to a family member or friend because of illness, frailty or disability. The initiative has been launched by Tammy Gotts, Lead Matron for Patients Living with Dementia, in partnership with Brenda McKenzie, Unit Manager of Sir Robert Ogden Macmillan Centre, Ben Haywood, Learning Disabilities Liaison Nurse, as well as the Trust’s Palliative Care Team. On the initiative, Tammy Gotts, said: -“The initiative aims to make carers feel valued, as they can play a pivotal part in the care of the patient. The Carers’ Passport entitles holders to open access, allowing them benefits that regular hospital visitors are not eligible for. These include out-of-hours visiting and overnight stays, as well as discounted food and drink in Harrogate District Hospital’s on-site restaurant and free hot and cold drinks on hospital wards. As part of the Carers’ Passport, carers may assist with personal care and bathing, supporting communication, care and discharge planning and assistance with patients’ medication- provided these are deemed appropriate and safe by the registered nurse. However, while admitted to hospital, the duty of care to patients remains with the Trust. Carers will also be given a brief induction with a member of nursing staff, when they are issued with their passport. If you are a carer providing support to a patient in Harrogate District Hospital or Ripon Community Hospital and would like a Carers’ Passport, they can be issued by Ben Haywood, Learning Disabilities Liaison Nurse, on:- 01423 553690, via a Matron or through the Palliative Care Team,- on:- 01423 553464. Pictured from left to right are: Brenda McKenzie, Unit Manager of Sir Robert Ogden Macmillan Centre, Sarah Davie, Palliative Care Nurse and Tammy Gotts, Lead Matron for Patients Living with Dementia. Paul Widdowfield, Communications and Marketing Manager, paul.widdowfield@hdft.nhs.uk and 01423 557470.